Karen Kuse of the Montessori School of Columbia presented improvements the school hopes to make to its property, which include an application to close to car traffic the 2800 block of Oceola. Emily Paavola of the school’s board said the school has filed a petition with the Richland County Circuit Court with an allowance for the City of Columbia to respond by Feb.17 to its petition. Ms. Paavola also stated that the recommendation to close the block came from the SCDOT. If the closing of the block is allowed, it will only affect car traffic; bikes and pedestrians would retain access. Residents expressed concerns that closing the block would route school traffic onto another block and asked the school to consider other options such as speed humps or reducing the speed limit. Ms. Kuse stated that she is open to residents’ suggestions and invited them to visit the school. The school also intends to build a new classroom building at 415 S. Maple and to renovate the home at 413 S. Maple. The school hopes to have concrete plans to present to the community at the April quarterly RCC meeting. Scott Mechling presented his plans to add on to the building he owns at 2910 Rosewood Dr. (5th Ave. Deli location) and to open a liquor store in the additional space. The liquor store will open to the BP parking lot and will be operated by the owner of the BP, Terry Blanton. Mr. Mechling stated that the liquor store meets the city’s requirements regarding parking and distance from the church. Mr. Mechling also intends to tear down the building located at 3000 Rosewood (old appliance store) and build a new mixed use 7000 square foot building. He plans to move 5th Ave. Deli to the site, which will also include a fitness business and three to four additional spaces. He has asked the city for a variance to the building’s set back so that it will be in line with 2910 Rosewood. David Miller of Rosewood Baptist Church stated that he and his congregation were opposed to a liquor store at the location. Many residents expressed concerns about the traffic in the BP parking lot and the corner of Holly and Rosewood St. as well as the impact of having a liquor store in the area. The next quarterly RCC meeting will be held April 17, 2014. Jenna Stephens called the meeting to order at 6:30 pm. The meeting began with elections for the RCC board. All current board members ran for re-election, with one contested race for Vice President (Pete Mayers). A vote was taken for the VP race, which resulted in Mike Miller being re-elected with a vote of 14-1. Jenna commented that there has been an uptick in home and car burglaries which CPD PACE Officer Alex Broder said may be attributed to the state fair. She encouraged all residents to contact CPD for a free home security assessment. The RCC board elected to let the temporary community character overlay expire after learning that it was not protecting properties as intended. The City intends to rewrite its zoning laws within the next two years and the community will be able to provide input. Jenna also reminded residents to keep their dogs leashed within Bates Park. Some residents near the park have expressed frustration with unleashed dogs entering their yards. Karl McCollester presented the new Voterheads website, a free service that allows citizens to receive information about local politics, upcoming meetings, and elections. Voterheads hopes to partner with RCC to provide meeting information and allow for online voting on RCC issues. Melissa Spring provided meeting attendees with an explanation of the Richland Library’s bond referendum campaign. The $58 million dollar bond will allow the library to improve its main location, build new libraries in rapidly growing areas (Ballentine and Sandhills), and renovate and improve all existing branches. Richland County Coroner Gary Watts spoke to the attendees as part of an effort to visit all city neighborhood associations. Mr. Watts explained the purpose and responsibilities of the county coroner’s office. The office recently earned a national accreditation. With no additional business, the meeting was adjourned at 7:30 pm. Jenna called the meeting to order at 6:30 pm and introduced Lane Goodwin as a new board member and secretary. District 5 County Council member Seth Rose provided an update on his initiative to improve the Rosewood Trail at Owens Field. An RFP has been issued for a design for the trail and storm water run-off issues have been discovered. Once these issues are addressed, the project can move forward. Richland County is providing $65,000 toward the project. Mr. Rose has sponsored a motion through Richland County Council asking the city to work with County Council to approach Associated Asphalt about relocating the plant to a more appropriate location in the county. Jenna stated that Mr. Rose’s motion is the only recent activity concerning the asphalt plant. The Easy St. area has been cleaned by the EPA and deemed safe from lead and arsenic. RCC still retains counsel but no lawsuit has been initiated. Corporal Scott Stover of the city’s Crime Prevention Unit spoke about home crime prevention. The unit provides free home security surveys. He encouraged residents to call (803) 545-3555 to set an appointment. He also spoke about the city’s new RAIDS online crime-mapping system. Officer Broder of the Proactive Community Enforcement (PACE) unit gave an area crime update. Residents have expressed concern about people walking through the neighborhood knocking on doors. Officers have field interviewed these people and determined they have valid peddlers licenses from the city. However, any resident may post a “no soliciting” sign on their home in order to not be solicited and is encouraged to call CPD if he or she sees suspicious behavior. Captain Navarro of the city’s Community Services Division introduced himself and spoke about the city’s Citizens Police Academy beginning March 5. The program is open to all residents but slots are limited to 30 citizens per course. Corp. Stover stated that an assessment had been done and sent to the city’s Park and Recreation Department about installing a call box in Owens Field Park. Jenna stated that RCC plans to raise money for bulletproof vests for CPD and will send an e-mail with more information soon. Also, a grant has been awarded to Rosewood Elementary School to install a sidewalk on Walker St. between Heyward St. and Harvard Ave.
Michelle Huggins announced that every Saturday from now until the end of February, from 2-5 PM, registration will take place for youth baseball. The league is looking for coaches and sponsors. Congratulations to RCC’s newly-elected secretary Lane Goodwin, and to Cyndy Storm, our newly-elected treasurer. Both were elected in a special election at the October 18th meeting to serve out unexpired terms. Thanks to Mike Dawson of the River Alliance and Betty Gregory of Citizens for a Greater Midlands for presenting the proposed projects in Rosewood that would be funded by the penny tax. Read more about the projects that will be implemented in Rosewood if the penny tax passes on November 6. Moryah Jackson–a candidate for Richland County School District One At-large–and Robert Rikard–the Democratic candidate for Senate District 20 both spoke at the meeting. The next Rosewood Community Council meeting is scheduled for January 17, 2013. The Columbia Star published an article about RCC’s July 19 quarterly meeting. In case you missed the meeting, here’s what happened. Here is a cheat sheet listing the top ten most common city code enforcement violations. The City of Columbia property maintenance division provided this list at the RCC meeting April 19. If you want to report a violation, call 545-3430. Thanks to City Zoning Administrator Johnathan Chambers and Housing Official David Chambers for an informative presentation on city zoning and code enforcement ordinances at our last meeting. Click here for the Columbia Star’s story about the meeting. If you see a crime in progress call 911. Non-emergency dispatch: 252-2911. Report anything or anyone suspicious. Rosewood community planning meeting—Feb. 16, Edisto Discovery Park, 1914 Wiley St.
Columbia Police Captain Sharp and Officer Brink reported on two incidents in the Rosewood area from September 25th until today. One was an intimidating phone call between individuals that was an isolated incident. The other was a burglary in the 3100 block of Rosewood Drive. Deputy Buzhardt with the Richland County Sheriff’s Office spoke on crime in the unincorporated areas of Rosewood. Concerns were shared about the perception of slow responses to calls in those areas. Candidate for City Council District 3, Moe Baddourah, spoke on his concerns about crime in Rosewood. He plans to install cameras at major intersections in the neighborhood if elected. Seth Rose, who will be the county councilman for Rosewood after redistricting is approved, introduced himself to the neighborhood. He says he asked to represent the Rosewood neighborhood under the new plan and is looking forward to representing us. The Montessori School of Columbia was given a special exception to expand operations to the other side of Oceola Street. Hawg Scooters, 1928 Rosewood Drive, was granted a special exception to open a scooter store. SCE&G has agreed to refurbish Rosewood and Valencia Parks. We’re waiting to hear back on what improvements will be made. The city is paving Rosewood Park. They will be developing a rain garden to catch the runoff from the newly paved lot. RCC officers are meeting with CPD, City Parks, and Councilwoman Gergel on Friday to discuss crime issues and problems with cursing and rough behavior at Owens Field Park. Rosewood resident and RCC member Foster Yarborough and two of his neighbors expressed their concerns over people who were letting their dogs run free in Bates Park without leashes against city ordinance. Also, they are not picking up after their dogs. The dogs are causing problems to the neighbors around Bates Park. They emphasized that they were not opposed to dogs in the park but were disturbed that the dogs were causing problems. Because of this, those neighbors in attendance wanted to make sure there were no plans to make Bates Park an official dog park. Meeting attendees were encouraged to attend the newly-formed Central Rosewood Neighborhood Association meeting on November 3, 6:30 pm, at the Rosewood Elementary cafeteria. 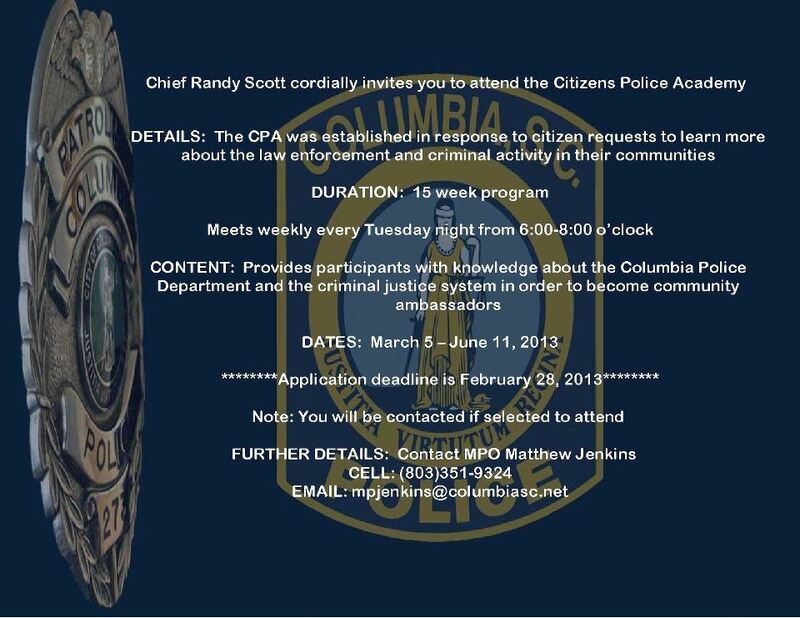 Columbia Police Chief Randy Scott will be speaking. There was not a quorum, so elections were postponed to the next meeting. Meeting attendees were encouraged to attend three planning sessions the city is holding for the Rosewood Neighborhood and Corridor Study. The first is a drop-in tonight from 6 p.m. to 8 p.m. so there is still time to make it over there tonight. Future dates are December 15, 2011 and February 16, 2012. RCC’s next meeting will be January 19, 2012, 6:30 p.m. at the Hamilton-Owens Field airport conference room.